Several members in this and another forum asked me about my method of incrustation "contour" of metal in wood. The common assumption is that the metal inlaid in wood is easier than metal inlaid in metal, perhaps judging is a more difficult processing of the metal as a whole. In reality, it does not. The problem is the inhomogeneity of the materials (base and inlay). They respond quite differently to changes in temperature, humidity, atmospheric pressure, and others. In the inlay type "metal to metal" once healthy are busy, no power to escape inlay. 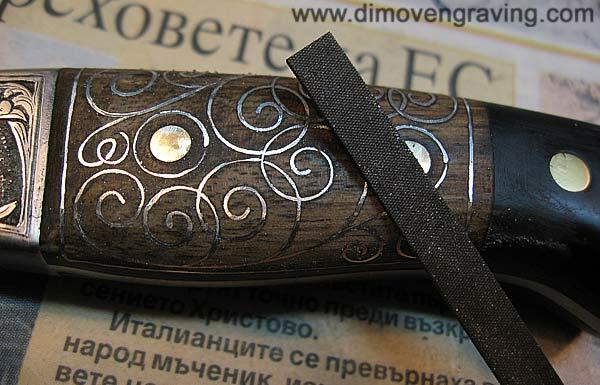 To obtain stable during inlay "metal in wood" , must fulfill all along inlaid quality. I think the pictures will show more. Here in steps, how to put inlay. Wow Evgeni, that's a nice tutorial of something I alway was curious about how it is done, thank you very much for sharing this with us !!! WOW that looks like fun!! now what projects do i have that i can try this out on? Evgeni, you are a true craftsman and one of good heart with your sharing nature. Not only beautiful work but you've gone to a great trouble to make an excellent tutorial which I have added to the Tips Archive. Thank you! I hope to meet you some day. Thanks Evgeni for the Tutorial, I will try this too. Is it pure silver you use because of the softness, or is it a sterling alloy? Beautiful work...... what glue do you use? 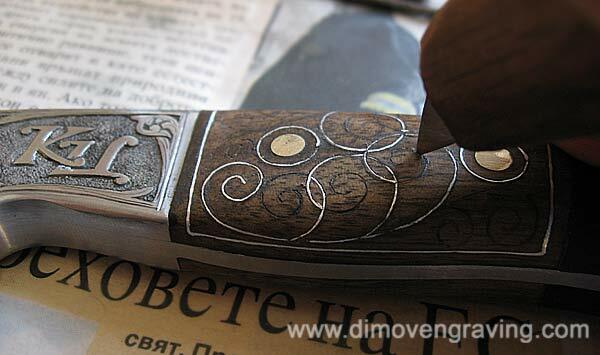 Very nice Evgeni, I've done it on flintlocks, and it's a LOT harder than it looks to get a nice smooth scroll. It will test your vocabulary. Great presentation and information. Much appreciated. Real nice Evgeni, may I ask if you use pure silver or a sterling silver alloy. In other words is it better to have a softer metal like for metal on metal inlay, or is it better to have a harder silver / gold as you have to hammer it in place. Great tutotial Evgeni,i was curios too in how younmake this beautyfull inlays and today i have learn a little more,thank you for youR kindness you are a great guy and a great artist! A very good tutorial, and your English descriptions are easy to understand. 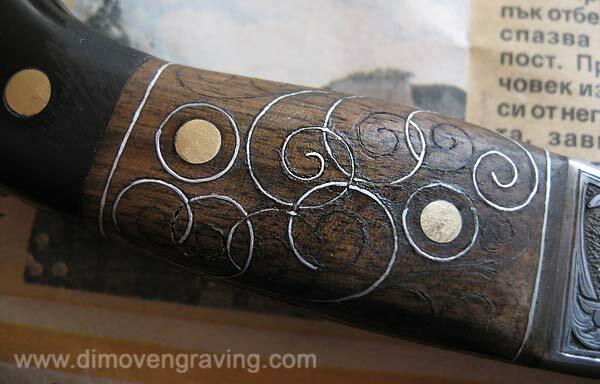 My approach to silver inlay into ebony is different, I have described it in other posts. Various techniques can produce results, and yours are excellent! 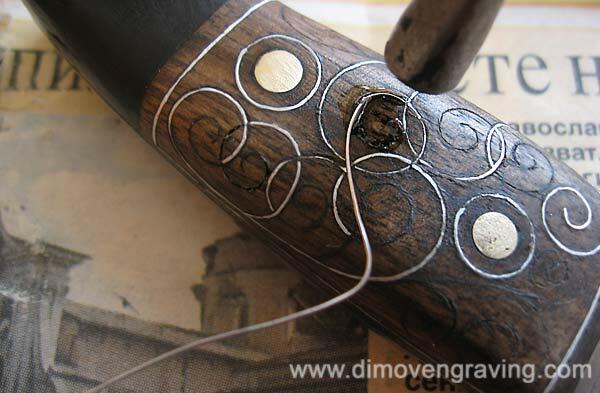 I have read, that silver inlayers in gun stocks suggest pulling the flat silver wire over a metal file, this raises barbs on the sides of the silver, helping to key it to the wood? Our colleague, Paul Hamler, has a nice way of inlaying metal into wood. Perhaps he will describe it to us sometime. Rod, yes that is correct in the way most of the fellows I know inlay their wire. I typically use thin wire .010" thick and yes, score the length by use of a file to form the striations or more surface area giving a slight undercut similar in a way to metal inlay. We will spread the wood fiber with a tool and after wire is set into the wood, the wood is dampened to swell it back in place. I wish I could do the animation as Evgeni has to explain it. A wonderful explanation in the animation alone! So guys will use Coke a Cola to dampen the wood. Another way is to cut the design in and use a tool to form a somewhat flat bottom trough. The wire is set into this small channel, the trick is to upset the bottom edge of the wire into a very tiny T shape so when the wood swells it holds the wire in the wood. One fellow, who does exceptional wire inlay, will cross the wires and actually lock them by cutting half through the one wire and the opposite way on the other wire that crosses over. The last trick is to cut a "bird's mouth" on the ends of the wire so at the termination of the wire an undercut is made in the wood below the surface and the bird's mouth is hooked into that undercut so there is no way to have the end of the wire lift over time and get caught on something which rips it out of the wood. On guns we usually use sterling silver or brass wire thickness would vary on skill and style of gun being built. 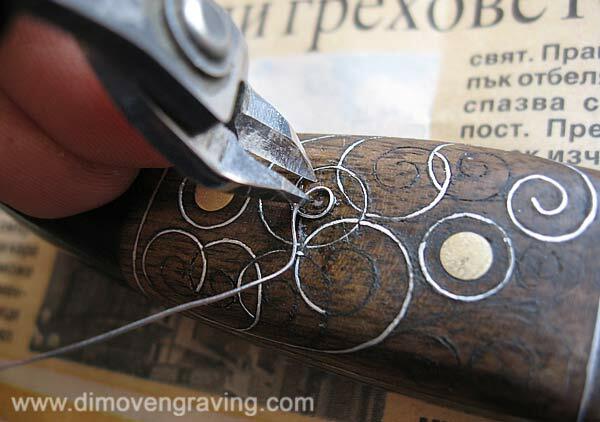 Thanks for the information Evgeni another great way of doing inlay. Great tutorial, Thanks for showing a somewhat exotic technique and explaining the concerns or the wood to metal. I found that post of yours. It's post #8 in this thread. You and I can easily route or end mill a slot in wood or metal that is five times deeper than its width, provided we are dealing with relatively wide slots, say, 1/4 to 1/2 an inch wide. But as diameter goes way down to try to mill a deep slot that may be as little as .007 in wide, the router or end mill is hopelessly weak and snaps off as soon as we try to go deep. Chances are that the original technique did not use that approach, so first let us speculate how they did it in the old days? I said that the very tight radii mean that stabbing chisels do not work. They are effective in gentler radii. These chisels are like a tiny sharp edged nail driven into the wood and slowly moved along the curve. In a tight scroll, the side forces simply split the wood off, and all is lost. So how the heck was it done on the original? The only simple technique that shows promise, and that does not unduly strain the side wall of the groove, would be to use a tiny 'bow' drill to drill a series of holes to follow the groove shape. With very many holes drilled side by side, the wood could be teased out between the ajacent holes to form a deep slot into which flat strips of silver could be painstakingly inserted, edge up, and then glued and finally filed and polished to give a crisp silver line appearing at the surface. 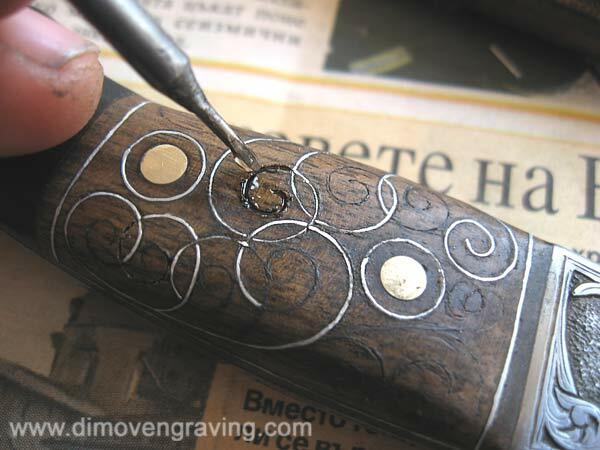 Easier said than done, as once the grooves are made the silver needs to be formed into the scroll patterns and also bent to conform to the round surface of the flute. This means bending the shaped silver on its difficult wide dimension. This is the best I can up with as the original technique, and I would be very interested in other ideas about this? In the old days there were plenty of very good artisans who would work for months on some fancy piece for a Lord or a Lady, and who could be engaged for very low wages. Even in my own case, as appentice toolmakers we were paid $2 a week at Rolls Royce while doing a man's job! So time was of not much consequence in the early days. I opted for another approach. I wanted to make a few of these fully ornamented flutes, so chose to do the art work separately. After studying the patterns it showed that many of the designs were repeated four times around the circumference in a seamless fashion. Others were used only once. The approach that worked was to lay the patterns out four times larger than life, and carve the grooves onto a series of large "postage stamps" and they use these with a special linked apparatus, I used a 4/1 pantograph linkage to reduce the designs to life size and cut them onto the actual flute. In a later post I will show a picture or two of the apparatus. When you first think about a four times bigger flute as the master, you have to think about a big flute that is 8 feet long! The pictures will show how that was avoided and the whole home made apparatus was only about 20 inches by 12 inches and about 14 inches high. total cost of materials apart from the handpiece was about $30, including the pantograph. The resulting grooves were so accurate, that I explored two ways of filling them. One with silver flat wire, and the other using very high silver amalgam. You will recognize that filling the grooves with amalgam will only look good if the grooves are very accurate, since the filled amalgam shows how neat or sloppy the ditch has been cut. But you can cut a somewhat sloppy ditch and insert a silver wire of even thickness. After filling your ditch with, say, superglue, and filing the silver wire flush, all that is seen is a nice even silver line and all the uneven groove is filled in with more or less invisable glue ... no so with amalgam. Both techniques worked well and I have a test piece where one side is solid silver and the other is silver amalgam. Most people cannot pick which is which unless they use a microscope. Dentists do not like to use high-silver amalgams to fill your teeth. They use low silver, as this is more crunchier and keys well to the tooth. But dental students who want to do their lab work examinations and have it look really good use "spherical" high-silver amalgams. These shine splendidly, like solid silver. Nice tutorial. Thank you for showing. Thanks Evgeni for the Tutorial not all people share knowlage but you have done so and with all the detail. Sam, I guess you write about "Gif" animation. I use 3 h mixture for gold leaf . Any glue that allows time to fix the insert , in practice will do the job. 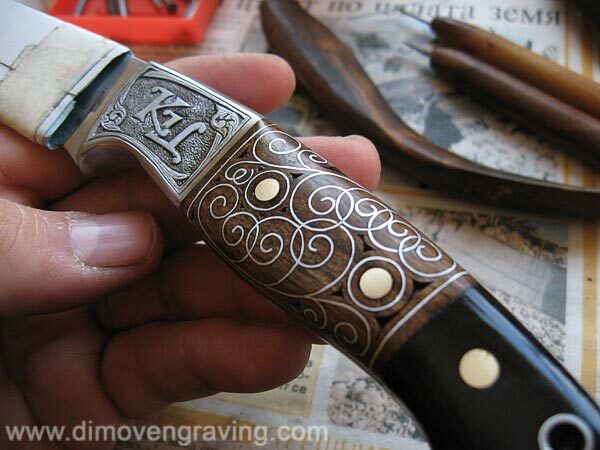 David Price is a well known builder of swivel breech flintlocks and also known for his carving and inlays. He has a 128 page book tutorial book available on inlaying wire. Click on "preview" under the picture for a look at 12 pages or so. He also has a similar book on carving scrollwork. ps.....Evgeni, your work is superb as usual.